Let me just say me and my mum are not hairdressers at all and I personally am happy to do my hair at home. My hair is extremely thick, beyond thick. It is that thick it takes two hairdressers to dry it. 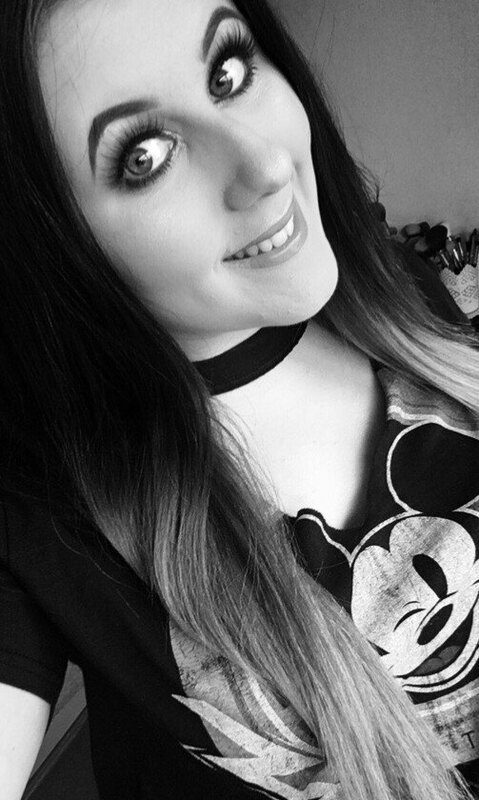 Even though I have dyed my hair multiple times a year for the past 10-12 years my hair is in really good condition so I was happy to bleach it at home. 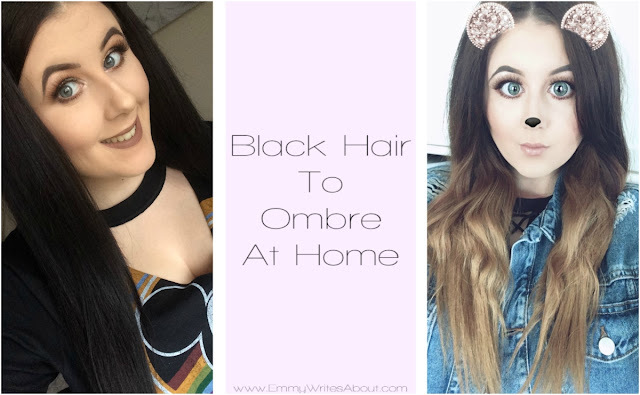 I thought I would share with you step by step how we achieved Ombre at home from my black hair and what products we used. I wouldn't recommend bleaching your hair unless your hair is healthy. The first product I used was the Colour B4 Extra Strength. 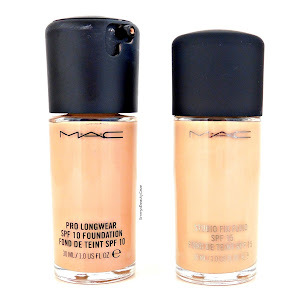 I have used this product numerous times in the past and it works really well. You basically apply it all over your hair, you need to make sure your hair is saturated in it. Then you have to keep your hair warm for 60 minutes. I wrap mine in cling film and then I put a bobble hat on top... Attractive I know! I will warn you the smell of Colour B4 is probably the worst smell I have ever smelt but the best part is there is NO bleach in the product so your hair is safe and won't get damaged. You leave this on for 60 minutes and then you have to go and wash the product off but you have to constantly rinse your hair for 5-10 minutes depending how long/thick your hair is. Then you apply a buffer and then repeat again. If you don't constantly rinse your hair for the 10 minutes you may not remove all of the colour. This step is vital. 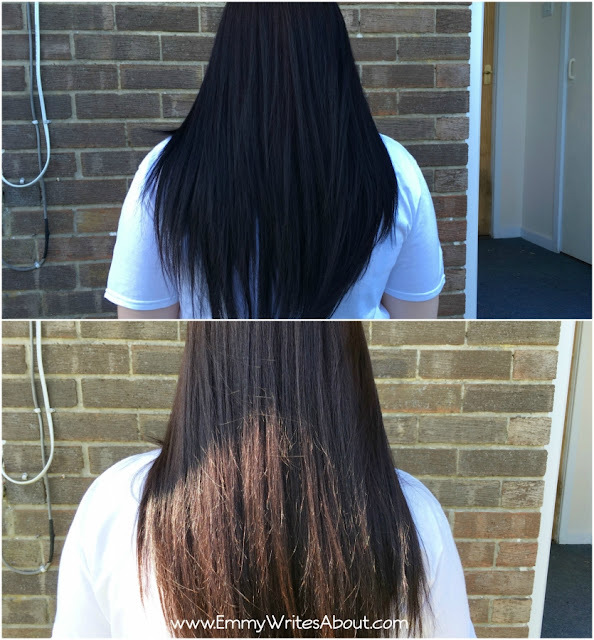 The point of Colour B4 is to restore your hair back to it's natural colour, it will not turn your hair blonde if your natural colour is brown etc... As you can see below it turned my hair from black to my natural brown colour. Now it is time to bleach. Because of how dark my hair is naturally I knew I would need to bleach it at least twice so be prepared for that if you have dark hair. On my hair I used sachets of powdered bleach and 9% volume developer. We used 1 tube of developer per 1 sachet. I did go to Sally's and asked what was best to double check I was using the right amounts. I would 100% recommend asking them as they are extremely helpful. Then we started to apply the bleach. We applied it from my jaw line down. I then wrapped my hair in foil and left it in for 30-40 minutes. It is recommended not to leave it in longer than 45-60 minutes maximum. Then I rinsed as normal. My hair was blonde in parts then very brassy orange in other parts. This is normal if you have dyed your hair alot. At this stage most people panic and just dye it back dark again but you only need to bleach it one more time then it will be blonde. I left my hair for around 5 days before I bleached it again as I didn't want to damage my hair. We did the bleach again exactly the same. I left it on around 30 minutes this time. Below shows how it looked after the first bleaching session, I forgot to take one after the second time. After the second lot of bleach my hair was blonde. When you bleach it don't do a straight line all the way around as you don't want a blunt line. Where it looks uneven below that gets covered with the dark brown hair dye and makes it look more natural with different tones of brown. The ends of my hair were very dry due to bleaching again but I found products that worked miracles! I have a post going up next week on the products I used to fix bleached damaged hair. I left my hair another week before I put any hair dye on as I wanted to improve the condition of my hair first. 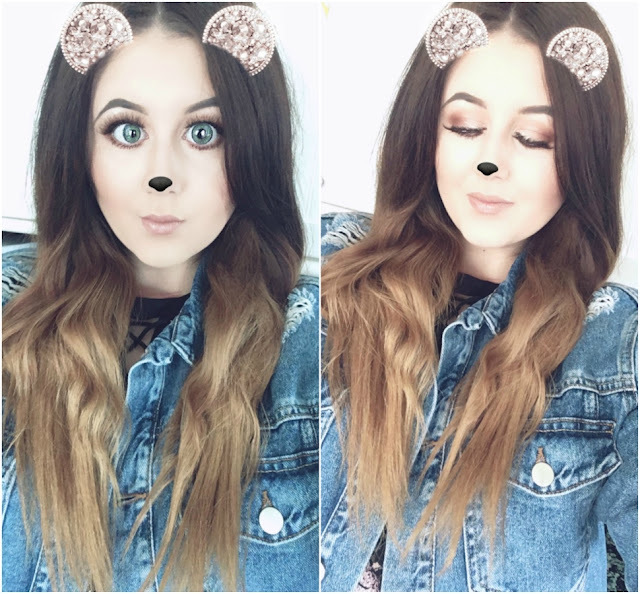 When it came to dying my hair I went with a brown that matched my natural colour so I wouldn't have to keep doing my roots then I wanted the bottom more of a honey blonde than a bright ash blonde. We did the dark hair dye first and went slightly above my jaw line, then we put the blonde on. 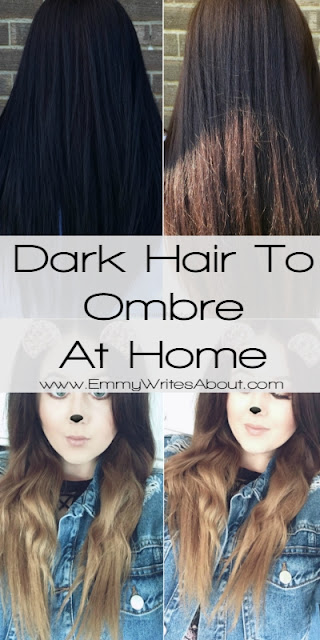 To mix the two shades together we put some of the brown hair dye onto a small hair brush and then brushed it through to blend the middle section together. One thing to be aware of when bleaching your is to not use heat on it afterwards. Try to either dry it on a low heat or let it naturally dry. Bleached Hair can take alot longer to dry then natural hair as it holds alot of water. I am so happy with how my hair has turned out. I will be putting one more lot of dark brown dye on just to blend it together a little more then it will be completely finished. 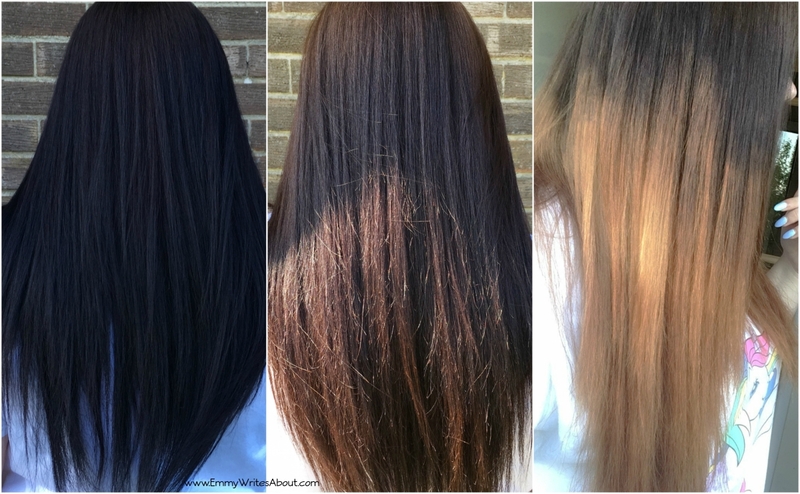 My post with all of the products I used to fix the damaged bleach parts of my hair will be up on my blog next Wednesday!